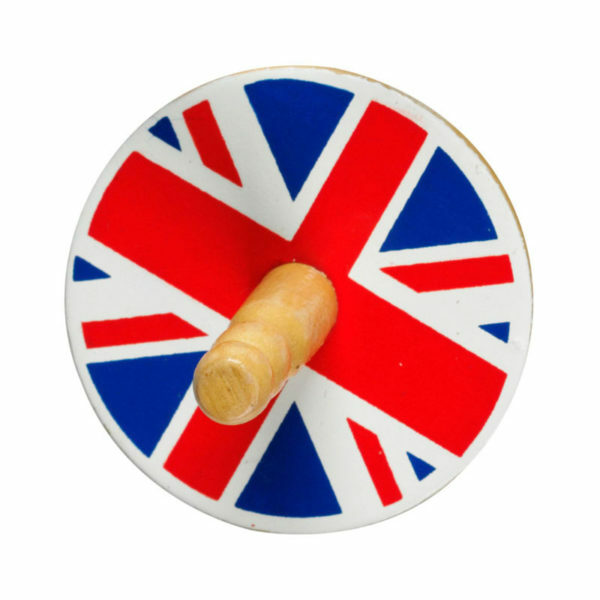 This traditional Union Jack Spinning Top from Lanka Kade is great fun! Give it a spin and watch the hand painted design go round and round making colourful patterns. Wooden spinning tops are a timeless classic. Traditional family fun that kids will love and bring back childhood memories for parents and grandparents alike. Perfect for party bags or as stocking fillers! Available in a choice of different attractive designs and characters including: dragon, football, octopus, London bus, fairy, robot, plus many more! Not suitable for children under three years, choking hazard due to small parts. Lanka Kade, which translates as ‘the Sri Lankan shop’, is the UK’s biggest supplier of fair trade toys and provides regular incomes to more than 200 Sri Lankan families. In addition to following the internationally accepted 10 Principles of Fair Trade this efficient and principled company believes in giving real opportunities to real people enabling their independence and giving them the ability to provide for themselves and their families with pride. Lanka Kade products can be bought in confidence, secure in the knowledge that producers are receiving the price for their work that they deserve. Designed to inspire imaginative play and packed with educational value, Lanka Kade products are beautifully handcraft, hand painted and have a unique, authentic quality. All of the wood used to make Lanka Kade products is responsibly sourced. Products are PVC free and avoid excessive packaging.